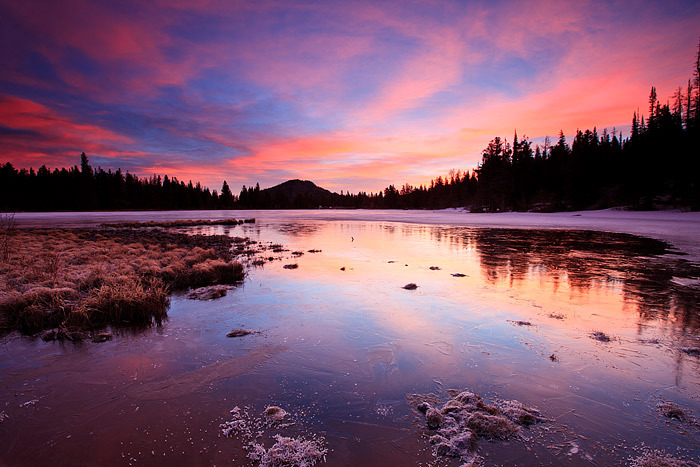 Wind blown ice at Sprague Lake helps to reflect a fiery winter sunrise in Rocky Mountain National Park. Looking eastward, high cirrus clouds make for a spectacular sunrise over Sprague Lake. Wind has blown most of the snow off a frozen Sprague Lake and its glass like surface makes a perfect foreground to capture this glorious Colorado sunrise. Photo © copyright by Thomas Mangan.